According the McKinsey Global Institute, improved communication through social technologies can raise the productivity of a knowledge worker by 20-25%. So why do so many companies still keep their employees off of social media? Often it is related to concerns about their familiarity with social technologies. During our recent webinar, Accelerate Your Social Transformation: Social Media Education for Employees, we asked attendees “How confident are you in your employees’ knowledge of your social media policy?” The results showed the largest number, 38.2%, were not confident at all, compared to only 6.3% who were very confident. This lack of confidence is clearly affecting the adoption of beneficial social media tools within businesses. So, where does it originate? 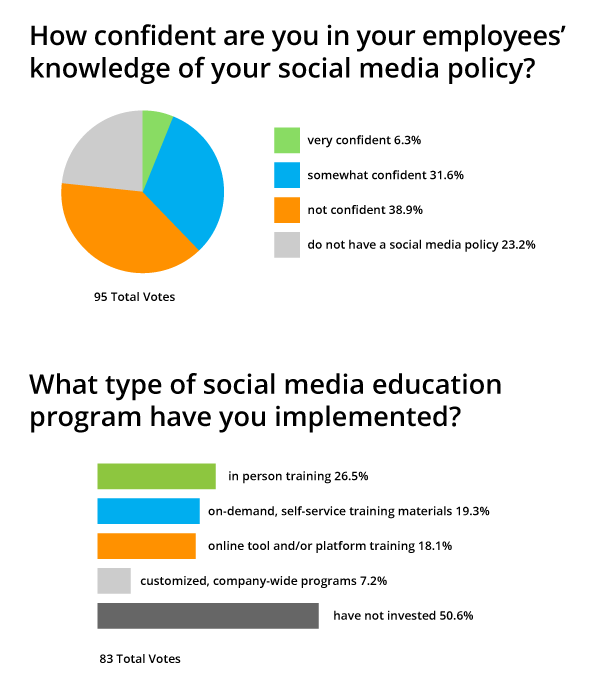 We also asked the webinar attendees “What type of social media education program have you implemented?” Over 50% responded that they had not invested in a social media education program at all. Not surprisingly, these results mirror industry trends. Flexible social media education and training programs are essential for instilling this confidence in employees and, in turn, helping leading organizations to accelerate their growth through social media. Michelle Lockett is the director of social marketing at Wiley. In this role she is leading the global social media strategy for the 207 year-old company as it transforms from a book publisher to a global provider of digital content and content enabled solutions. Prior to Wiley, she was the global director of social media for Bloomberg, where she led the company’s first forays into social media. Jeanette Gibson is responsible for managing Hootsuite’s global 24×7 support organization and the company’s industry-leading education and training programs to help Hootsuite customers realize the potential of social media to drive business value. The community team engages with Hootsuite’s vibrant community of 9M users via online engagement, advocacy and community events. Dr. William J. Ward is the professor of social media at the S.I. Newhouse School of Public Communications at Syracuse University. He helps organizations from wide-ranging industries integrate new media and digital technologies into an integrated communication strategy. He is a pioneer in using digital and social learning technologies for professional development. Join the conversation online using the #HOOTEDU hashtag.